Mevlut Cavusoglu, Turkey’s foreign minister said that Turkey warned about possible steps against the self-defense forces of Syrian Kurds, if they do not leave the Syrian city of Manbij. ANKARA(Sputnik) — Ankara has warned Washington about possible measures against the self-defense forces of Syrian Kurds, if they do not leave the Syrian city of Manbij, Turkey’s foreign minister said Tuesday. "As the PKK [Kurdistan Workers' Party] does not represent Turkish Kurds, the self-defense forces do not represent the Syrian Kurds. If they do not leave Manbij to the East of the Euphrates, then let the United States not take offense", Mevlut Cavusoglu told the Kanal 24 TV channel. 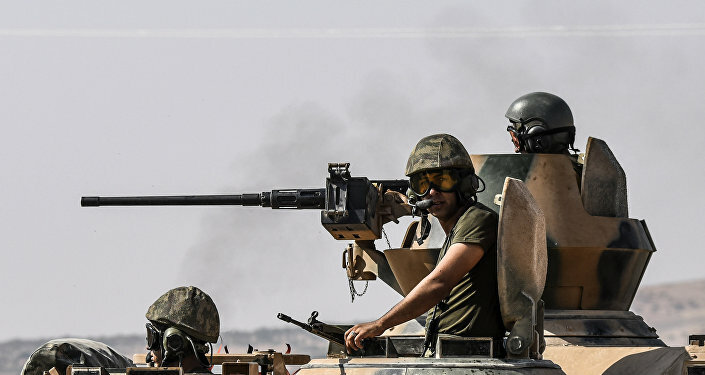 On August 24, Turkish forces, backed by US-led coalition aircraft, began a military operation dubbed Euphrates Shield aimed at freeing the territory of 1,931 square miles from terrorists and creating security zones for accommodation of refugees. Turkish forces regularly come into confrontation with the Kurdish Democratic Union Party (PYD), and its military wing People's Protection Units (YPG) operating in Syria, which Ankara considers to be an affiliate of the Kurdistan Workers' Party (PKK), outlawed in Turkey. Meanwhile, the United States consider the self-defense forces of Syrian Kurds to be an ally in the fight against the Islamic State (ISIL or Daesh) terrorist group, banned in Russia, and support them.